Design rule violations are clearly marked by Violation Objects. A violation object marks where one or more design objects are violating a design rule. Violation objects are also known as DRC (Design Rule Check) Error Markers, they are added to the design when a violation is detected by the online or by the batch Design Rule Check (DRC) feature. Violation objects are automatically placed by the Design Rule Check feature, they are not objects that are placed or edited by the designer. When either the online or the batch DRC is run, each design object that violates a design rule is marked by a violation object. The rules that are currently being checked are configured in the Design Rule Checker dialog, as shown below. Click Home | Design Rules | to open the Design Rule Checker dialog and configure which rules are to be online and/or batch checked. 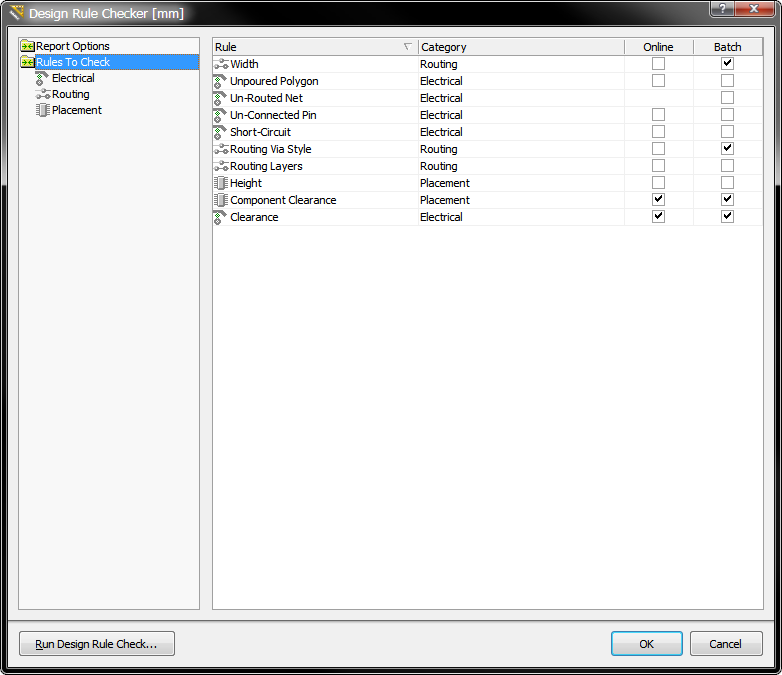 Both online and Batch rule checking is configured in the Design Rule Checker dialog. Each design object that violates a rule is marked by a violation object. There are 2 types of violation objects, DRC Error Markers and DRC Detail Markers. DRC Error Markers - these are markers applied to the entire object that is in violation, regardless of the location of that violation. These objects make it easy to quickly see where there is a violating object, regardless of the zoom level. DRC Detail Markers - detail markers show the location and the reason a design rule is in violation. These markers give instant feedback on the condition that is being violated, and are placed at a violation location. The images below show how the 2 types of markers work together - the images on left are zoomed out, the images on the right are zoomed in on the same violations. The upper-left image shows clearance violations marked by a DRC Error Marker (in green), the upper-right image shows both the green Error Marker and also the white Detail Marker, indicating that the clearance is less than the 0.2 mm specified in the applicable Electrical Clearance design rule. 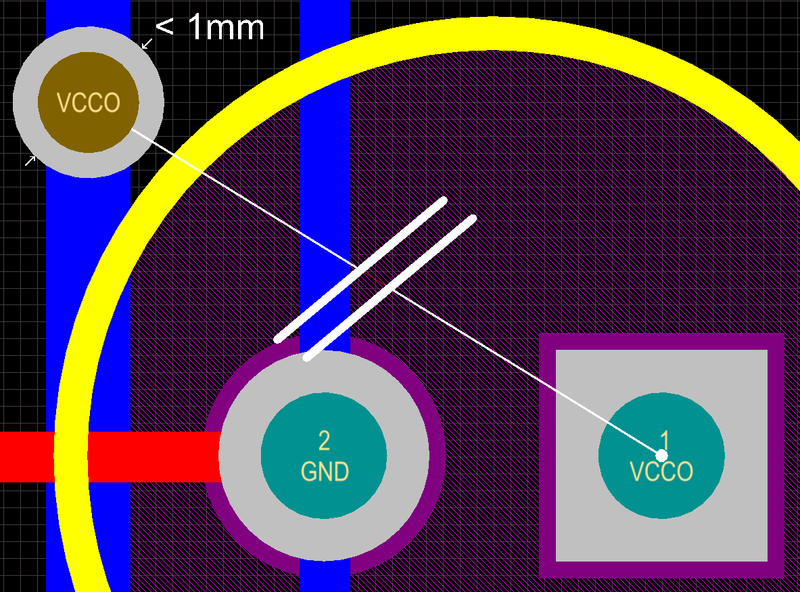 The lower images shows vias that are violating, in the lower-right image the Detail Maker shows that the via is less than the 1mm specified in the applicable Via Style design rule. Clearance violations, zoomed out the Error Markers are visible, zoomed in the Detail Markers become visible. A Routing Width violation shown at 3 different zoom levels. Error Markers can be seen regardless of the zoom level, zoom in to see Detail Markers and the actual violation. The presentation of the violation objects can be configured in the following ways. Configure the color of the Error and Detail Markers in the View Configurations dialog. The point at which the Violation Detail Markers are displayed while zooming is controlled by the Show Violation Detail slider. Configure the Overlay Style (Style B in this example) and how Error Markers are displayed at different zoom levels. The enabled design rules determine which rules are checked and when they are checked (online and/or batch). 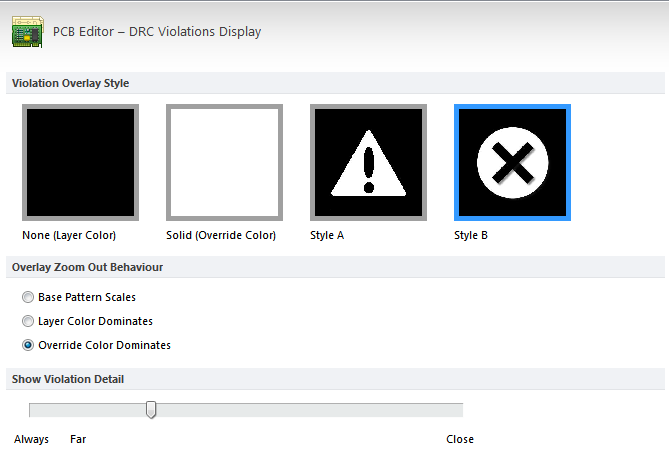 How detected violations are then marked is determined by the DRC Violation Display Style settings in the PCB Editor - DRC Violations Display page of the Preferences dialog. As the designer you can configure the display to show just the Violation Details (Detail Markers), or to show a Violation Overlay (Error Markers), or both. Enable the check boxes as required, or right-click in the dialog to toggle multiple options on or off. Enable which violations will display as Details, using an Overlay, or both. There are a number of ways violation information is displayed within the software. The violation markers (both Overlay and Detail) provide strong clues to the location and nature of the violation. For example, in the image below the via on the left has a detail marker that shows the diameter of the via is less than 1mm, so it must be smaller than the size allowed in the applicable Routing Via Style design rule. There is also a line drawn from the via to a pad that is nearby, and this line is broken by a double-slash. This indicates that the net is un-routed (broken) between the via and pad. Use the detail markers to help interpret the error condition. Detail Markers showing a via that is under-sized, and an un-routed net. As well as the markers, all detected violations are detailed in the PCB Rules and Violations panel (Home | Design Rules | ). The image below shows a section of the panel with the Un-Routed Net Constraint selected, below that it shows that there is 1 Rule selected, below that it shows there is 1 Violation of this rule. 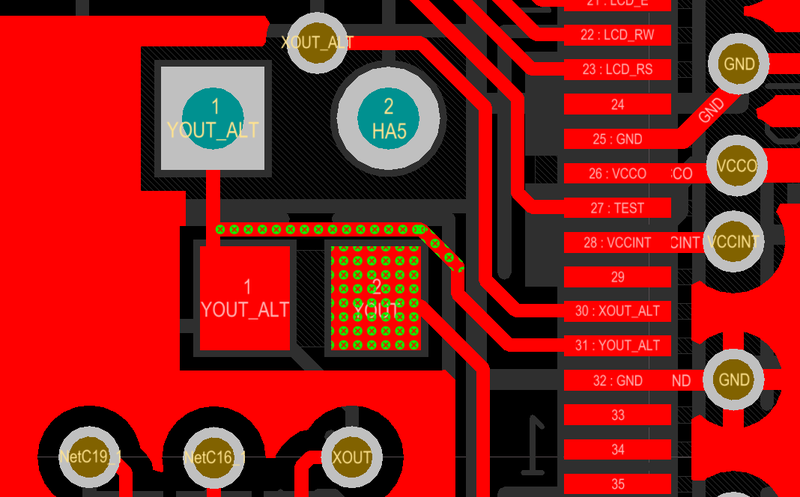 Use the PCB Rules and Violations panel to quickly locate design rule violations. Click once on a violation to zoom to that violation in the workspace, double-click on it to open the Violation Details dialog, which details both the Violated Rule, and the Violating Primitives. The Violation Details dialog shows both the rule and the primitives involved with the error condition. Violation objects can be removed by running the Reset Error Markers command, click Home | Design Rules | Design Rule Check » Reset Error Markers. Note that this simply removes the error markers, the underlying design rule violations must still be analyzed and resolved.